I like this page from Amazing Spider-Man #560, published a few weeks ago. Written by Dan Slott and drawn by Marcos Martin, it is at once refeshingly contemporary and delightfully retro. The idiotic continuity reboot of the Spider books last year has led to a series that in large part tries to recapture the energy and charm of the classic 60s/70s series as masterminded by Stan Lee. How well it succeeds I don’t know because I’m not following it, but if this issue is anything to go by, I’d say pretty well, all the while adding a little contemporary freshness to the mix. The page captures the human grounding of the character. 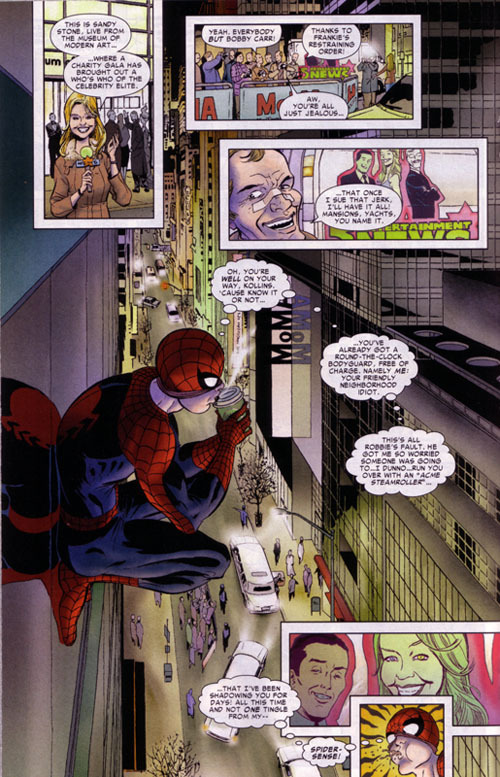 Spider-Man is on the stakeout in front of the new MoMA and is staying warm with a canister of ‘Starbrand’ coffee. Down below him, an exhibition opening is taking place, with the entertainment media waiting for a certain celebrity to arrive inserted in soundbite-size panels down the page, until our hero’s spider-sense tingles, interrupts the scene and leads us on in the story. I really like the attention Martin has paid to the actual location, and to detail in general, all of it rendered in his elegant line. The aforementioned coffee brand has, for example, been set up previously, and photo-referencing makes West 53rd Street eminently recognisable — it gives us a great sense of place, without losing the fluidity of the interpretation. It’s a pity that today’s American mainstream artists make so little use of the real locations on offer when drawing their books, especially those that take place in that centre of superhuman activity, NYC. 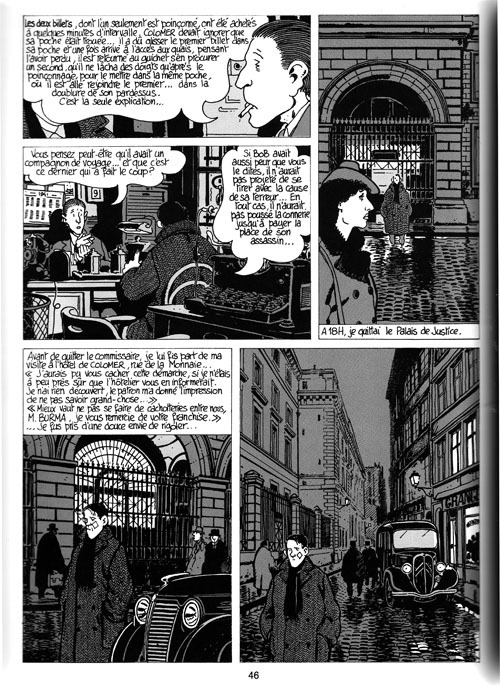 I suppose this has to do with their tight schedule, but it seems to me that there’s a big untapped potential in making the city itself a living, breathing character on the page, just like Tardi does it with Paris in his comics. On the following pages there’s a fun chase through a 60s pop art exhibit at the museum. A nice, and graphically attractive, tribute to the decade that spawned the Spider, and fun times!